Broker calculators have been running red hot over the past week working through the implications of the large cash balances of some of the world’s largest companies, now that Apple (which is now up 10% in the past month) has told everyone that it is going to undertake what looks like the largest share buyback ever – US$100b. In conjunction with the tail end of the existing buyback (around US$25b) and looking at Apple cash generation and balance, as well as street forecasts for on-going buybacks, it is safe to say that a number closer to US$200b will be the figure by 2019/2020. That is a reduction of around 21% of the total number of Apple shares on issue. It means, obviously, that earnings will be significantly concentrated, as shown below. Corporate Australia, take note. That is a reduction of around 21% of the total number of Apple shares on issue. It means, obviously, that earnings will be significantly concentrated, as shown below. Corporate Australia, take note. (We have disregarded the interest income for the purpose of brevity, however in Apple’s case, because of globally low interest rates, the impact on the transaction is not meaningful). 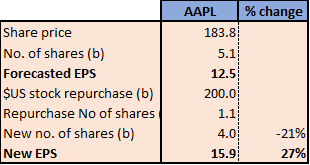 The fact is a buyback of this size adds 27% to EPS calculations. But it isn’t just Apple. The table below shows just how much, per share, is sitting on the balance sheets of some of the other big tech companies. Simply paying out the cash, which is possible because it has been repatriated to the US following Trump’s tax package, shows the effect on the PER below. Students of valuation know that in the current low interest environment cash is earning less than 1% at most in the US and Europe. So handing it back to shareholders in the form of buybacks or dividends would have a minimal effect on the running or the profitability of the company. This is pretty simple stuff. But it goes further than that. It is a principle of finance that companies should have a mix of debt and equity – equity because it is permanent and doesn’t necessarily provide an annual cash return, and debt, which because it is temporary and comes with an interest rate is priced more cheaply. The table below shows an initially debt-free example company using $158m to repurchase 10m shares of its own stock, and the additional value it creates. 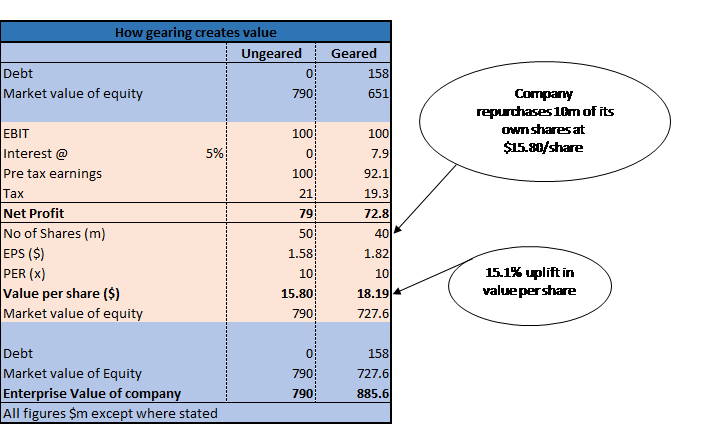 How regearing works The first column shows the company ungeared, and the value per share at which it trades. It concentrates value by borrowing $158m in debt and initiating a share buy-back of 10m of its own shares. The company has now incurred a 5% interest charge (which is higher than a triple A borrower like Apple would book) on that debt, lowering its net profit relative to its ungeared position, but it has also lowered the total amount of shares outstanding. Applying the same multiple results in a higher share price. The end result is that this buy back is EPS accretive with shareholders in the company up 15.1% on the deal. Of course, the slight lowering of net profit isn’t the only flow-on effect of the company’s re-gearing. Increasing leverage could arguably make the company riskier. However, this needs to be put into perspective – the ratio of debt to equity is around 1:4 while its interest cover is ten – hardly excessive. The isn’t just a bit of theory. Because banks don’t like to lend to companies without stacks of physical collateral (like property, or oil wells) and because of the tech wreck, banks globally have not really featured in the list of lenders to the big tech companies. There are cashflow lenders out there, but their rates are usurious, as they say, and simply not commercial for large companies. Not that the banks have been missed – the size of the cash piles of these companies has meant that they simply haven’t had an appetite for debt; and of course those cash piles exist because of the profitability of the underlying business, whether backed by appropriate collateral or not. But it means that some of the world’s biggest companies are undergeared, meaning that they are pregnant with a share price value uplift because of this re-gearing. You could say that the market knows this, and in my view large chunks of it certainly are aware. But there is nothing like seeing earnings being concentrated up to really get the blood rushing into the share price, as we saw on the weekend with Apple, which jumped 4% to US$184/share, having already climbed 6% in the previous days. As the table above shows, the re-gearing story applies to stack of debt free companies. It seems highly likely that we are going to see a wave of stock re-purchases and dividends from companies previously assumed to be useful for capital appreciation only.